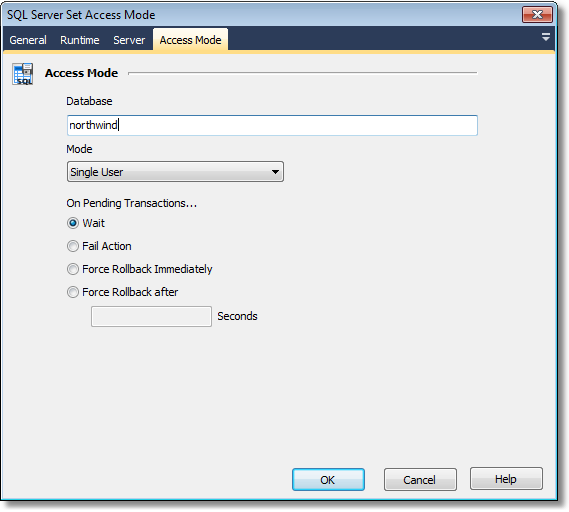 The SQL Server Set Access Mode action enables you to change the access mode of a database. The database which to change the access mode. The mode to set the database to. Single User - Single user mode allows only a single user to be connected to the database any one time. Restricted User - Restricted user mode allows only members of db_owner, dbcreator and sysadmin to be connected to the database, but does not limit the number of connections. Multi User - Multi user mode allows all users with the appropriate permissions to connect to the database. Determines how to react to pending transactions when the mode is being set to Single or Restricted. Wait - The action will wait indefinitely until all transactions have been committed or rolled back. Fail Action - The action will fail if any transactions are pending. Force Rollback Immediately - Any transactions that are pending will be rolled back immediately. Force Rollback after - Any transactions that are pending will be rolled back after the specified number of seconds.